Finished size about 42″ x 42″. Four colors in 100% cotton. Download word doc. Embroidery floss for the knots and a 44″ square of batting. Sew each of the color number 3, 4, and 5 strips to a color number 2 strip, shown here as white. Press seams toward darker color. Lay out on cutting mat. Cut across at 6-1/2 inches. You should get 6 from each strip set. Put like colors together. 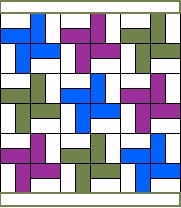 Sew two pieces of the same color together as shown, one vertical to one horizontal. Press toward the vertical square as shown by arrows. You should have six of each color. Sew each pair of blocks to another turning the second one 180 degrees. The pinwheel pattern will result. You should have 3 pinwheel blocks of each color. Sew 3 blocks of different colors together. Sew one set of 3 starting with color number 1, and one starting with color number 2, and one starting with color number 3. Lay the three rows of blocks out to form pattern as shown to the left. Sew the 3 rows together. Press. STEP 7 Sew on the borders. Measure width of quilt. Pin top and bottom borders to quilt, right sides together with quilt, short edges extending a bit beyond quilt. Sew with a 1/4″ seam, then trim ends to match the width of the quilt. Repeat with two more border strips. STEP 8 Making the sandwich. Press the fabric to be used for the quilt back. 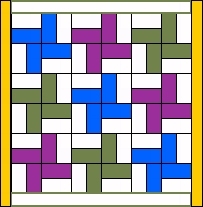 Lay out a piece of batting the required size (should be 44″ square) on a flat surface. Place the pressed piece of backing fabric RIGHT SIDE UP on top of the batting. Place the completed, pressed top WRONG SIDE UP on top of backing. RIGHT SIDES TOGETHER! Smooth the wrinkles and center the top on the batting and backing. The top will be slightly smaller. Make sure the backing and batting are the same size or a bit larger than the top. Pin around the edges, through all the layers. STEP 9 Tying the quilt. Use all 6 strands of embroidery floss threaded through a needle. From the top of the quilt, push the needle through and back up 1/4″ away. Pull the thread, leaving about 4″. Wrap the threads in the right hand not once but twice around the other thread. Pull tightly. Tie again, wrapping the left thread two times around right. Repeat this in a pattern over the whole quilt. Every 3″ to 4″ is good coverage. Trim floss ends to 1/2″ to 1/4″. Your pinwheel crib quilt is done!